Lorises and pottos are small (85 g – 1.5 kg), arboreal primates of Africa and Asia. Six species placed in 4 genera make up the family (previously known as Loridae). They are small animals, stealthily stalking insects or seeking fruit at night and spending the day in hollow trees or clinging to branches. 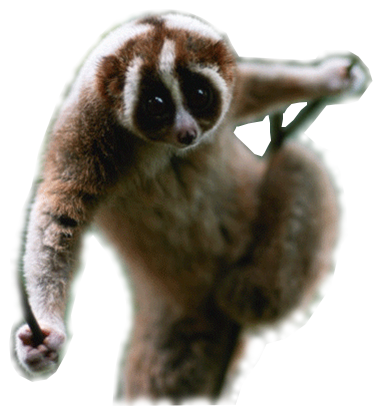 Lorises and pottos climb with deliberate, hand-over-hand movements, never leaping between branches. While their actions are usually slow and deliberate, they are capable of moving rapidly if necessary. The hands and feet of lorids are capable of powerful grasping, and these animals travel along the underside of branches as easily as along the top. Their tails are very short, seemingly absent in some species. Lorises and pottos have thick, wooly pelage, darker on the back than the venter. Their eyes are large and directed forward. All lorises produce a toxin (very rare for mammals) and release it anywhere between the elbow and armpit. The toxin is thought to be a deterrent for predation but, orangutans have been observed hunting and eating lorises on occasion.